The Guardian Group steering committee decided in May, 2018 to suspend its routine meetings and operation. First, the US government’s anti-refugee policy has stopped newcomers from coming to the Bay Area. The group last received a refugee client in July, 2017. 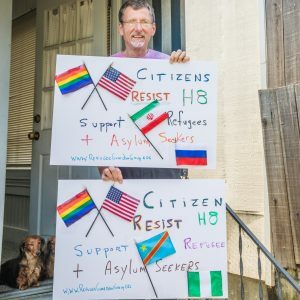 While a trickle of other queer refugees – maybe two or three this year – have come to the Bay Area, the official volunteer agency (VOLAG) tasked with resettling them has placed all them in the East Bay. That brings up the second reason the group has not had additional clients: the housing costs in San Francisco. Even with the very modest government benefits for refugees, it is very, very difficult to find places for newcomers to stay that fit their small budget. So, the VOLAG has relied on people in the East Bay who have volunteered to provide discounted housing for its few new clients. There haven’t been enough new refugees for the VOLAG to seriously try to locate refugee housing in San Francisco. Moreover, attempting to help newly-arrived asylum seekers is beyond the capability of our small volunteer program. Asylum seekers receive no government assistance and are ineligible for public benefits (except for medical care in San Francisco). Our group feels that it would be misleading to offer help to asylum seekers when the costs of living cheaply in San Francisco still is well over $1,000 a month and our foreseeable donations and gifts total only a few thousand dollars for the year. We cannot responsibly offer to “support” a new asylum seeker arriving in San Francisco. Rather than meeting while having no new people to help, the Guardian Group has decided to support its existing clients who still qualify for aid. We are ready to start meeting again as soon as our committee finds out newcomers are coming, housing is available, or donations are flowing in. We have volunteers ready to reactivate the group when new refugees arrive. But, for the moment, we will check in, mentor, and care about the 18 people we have met as refugees and asylum seekers since 2011. We plan on celebrating at the church some individual refugee and asylum seeker success stories in the fall, and we give great thanks for the members and friends who have supported our clients with housing, financial donations, and love. This entry was posted in General Comments and tagged anti-refugee policy, US Government on June 2, 2018 by Moderator. Thank You! You Gave $6,195!! We Are Halfway to Our Faithify Fundraising Goal!